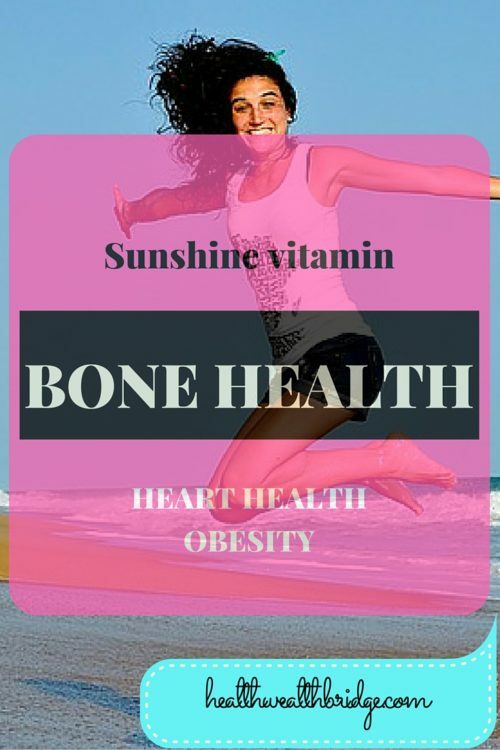 Home » Blog Healthwealthbridge » VITAMIN D Deficiency:Is it a Myth? VITAMIN D Deficiency:Is it a Myth? The Vitamin D deficiency: What could be the story? Many of my busy cousins in their thirties are having a variety of old age problems. Hypertension, diabetes, deranged lipid profile, nothing seems to be left.But is chronic stress the only culprit? While reading the many research papers, I found a surprising answer. Lifestyle and your diet really do decide your health. Vitamin D is suspected to have a role. Vitamin D is the miracle vitamin which has a range of goodness. This sunshine vitamin can bring the sunshine into your life. Not only physical health but your mental health is also influenced by Vitamin D.
Shocked ?I was too.Do you know anybody with hypertension? Anybody with diabetes?What about somebody who is having a weight issue. You must be knowing someone who has depression. It’s another chronic problem of our times. They might need to check their vitamin D level in blood.Do you have Vitamin D deficiency? Have you ever tested for your blood level of Vitamin D? Are you overweight?All over theworld, in both developed and developing nations VitaminD deficiency is a highly researched topic.Undernutrition and deficiencies of micronutrient is not surprising.What is surprising is that Vitamin D deficiency is present even in overweight, obese people.This has created the shocking nutritional state known as ‘Malnutrition of Obesity”. The USA , as well as worldwide Vitamin D, ppears to be a micronutrient which is largely deficient in most. 50% of world population.Yes the rate is that high. 1 billion people worldwide suspected to be suffering. There’s a pandemic of vitamin D deficiency worldwide. The cause is suspected to be environmental pollution, that’s preventing synthesis of Vitamin D by your skin. Sunscreen(with SPF more than 30) use is another reason which decreases vitamin. Obesity decreases vitamin D .Decreased Vitamin D makes it difficult for you to lose weight.Vicious cycle. Vitamin D is a very special fat soluble hormone. You can synthesize this vitamin in your skin. Breast fed infants (If mother is deficient baby will be deficient. People of Australia, India, Middle East, Africa, and South America. What the right level of Vitamin D? How can Vitamin D protect you? Maintains the health of your heart and blood vessels. Protects against cancer. Most significantly colorectal cancer. Less risk of type 2 Diabetes. Vitamin D helps prevent cognitive problems associated with aging. It helps in depression by preventing relapse. Helps in decreasing the dose of medicines in depression. How much can Vitamin D be given? After measuring your serum Vitamin D level the right dose can be calculated. The Mega dose may need to be given to get the deficiency corrected. Measure your vitamin D level. Have a diet rich in Vitamin D.
Don’t forget to start vitamin D supplement if you are deficient. Design your own healthy lifestyle. Be strong live healthy. What’s your Vitamin D status? Have you ever tested? Let me know in the comments below. This article is meant to spread awareness about health. It is not a substitute for a professional medical consultation. Read my full disclaimer. Very informative and helpful post. Thanks for the details. wow such a wonderful article on vitamin D. i feel the need of vitamin D. After gaining weight everything changes. Depression is the first which attacks me.I have to consult a doctor. Yes it’s best to consult a doctor before starting any supplements. Nice and relevant post. Many people are suffering from vitamin D deficiency because to proclivity to sit in an AC room and less exposure to sunlight. So far a lot of attention has been paid towards Vit D and osteoporosis. It appears that the vitamin controls many other important functions. A very important post. Many people suffer from vitamin D deficiency because of less exposure to sunlight. Many tend to sit in cooler room and not get exposed. One of the most important cause of worry of vitamin D deficiency is osteoporosis or brittle bone. It is also important to regulate many other functions as described in this post. I have recently had myself checked for Ca and Vit D. This article is very useful and it is important to have it checked. I still remember those days when I had just started to get back aches and doctor advised Vitamin D tests and viola I had the lowest numbers. It is indeed an essential vitamin and not all of us are aware of this. This is a very-very useful and informative post. Can’t agree more to your article. In this busy lifestyle so many disease have groped up. People don’t want to sit in Sun to get the much required Vit D and prefer AC that’s the culprit. Such an informative post. Nowadays vitamin D deficiency is very common. Thanks for sharing. This is the most common deficiency that is easily diagnosed even in people living in healthy environment. My brother living in hostel develop when problem in his backbone appears. This article is a myth busters for many. one of my relative is also suffering from such a deficiency and I have realized over the time that many are unaware of this problem. Its a good initiative of yours to spread the awareness of VItamin D deficiency. Very informative and I never knew Vitamin D protects the heart too. Very interesting post Amrita. I took Vit D during my pregnancy and have started with another two month course a week ago due to constant feet ache. Vit D def has emerged out somewhat as a Pandemic. Such an eye opener this post is buddy. It’s high time we get it checked. There is much contradiction about the time spent outside in the sun. Some reports say exposure to sun between 7 and 10 am works favourably while many others negate this. This is common about researches. The foods suggested here are all non-veg. Are there any veg alternatives rich in VItamin D? Such a world of information! I don’t think many knows about Vitamin D deficiency! This is great information. We rarely realize the damage the deficiency of this vitamin causes, until it is too late. Thankfully nowadays we have better diagnostics. Whoever thought in a land of ample sunlight people would be deprived of this naturally occurring vitamin?! This is good to know information! I didnt know trylt that there can be so many problems associated with Vitamin D deficiency- I guess its about time I get myself checked! Hey thank you so much for sharing this!! As I had this deficiency during pregnancy ! I take vitamin D – and I eat lots and lots of fatty fish – I remember when I got a blood test done, my doctor was terrified by my vitamin D levels because they were so high… But I was SO PROUD! haha! Pandemic is a good way to describe this problem since it’s so widespread. I had my Vitamin D tested a while back and it was very low. Really common these days with people working crazy hours and not getting enough sun. Plus we’ve been warned for years about limiting exposure to sunlight due to the risk of skin cancer. I’ve done some research on Vitamin D, and spending more time in the sun is important, but people can also take supplements (try somewhere between 4000-6000 IU daily). Also, make sure it is Vitamin D3. You are right Fred .The supplement dose can be high depending on the vitamin D level.I have written about that here. Amrita, this post was among the most clicked on the Bloggers Pit Stop. This is a very helpful post. Congratulations, be looking for a feature on Friday. Thanks Kathleen. Iam honoured and very happy to hear this news.Thank you so much for the opportunity to link up at the Bloggers pit stop. This is really interesting. We’re always told to cover up and protect ourselves from the sun, but we do need vitamin D too. I guess it’s about finding that balance. Thanks for all of this information on Vitamin D. I am quite deficient despite sun exposure and I have to take supplements, so I am glad that you are making others aware of this common problem. Bloggers Pit Stop – the home of great posts. Yes Samantha you are absolutely right. I think “pandemic” is the right word to describe this problem, because it’s so widespread. I had my Vitamin D level tested a while back and it was very low. This is a common problem for people in today’s world full of nightlife and artificial light, and also the further we live from the equator the less sun exposure we get, especially in the off-season. Plus people have been warned for decades about limiting exposure to sunlight due to the risk of skin cancer. I’ve done a fair bit of research on this topic, and spending time in the sun is the most efficient way to fix this problem, but people can also take supplements as well (try somewhere between 4000-6000 IU daily), and make sure it is Vitamin D3. Very interesting! I agree that majority of health problems are due to deficiencies in vitamins & I also think food allergies//intolerances. Very informative post! You are right Dani.It’s all lifestyle . I live in Alaska and I take a Vitamin D supplement per my doctor’s orders because I do not get a proper exposure to sunlight over the fall, winter, and spring or from November to March. If I don’t get enough Vitamin D, I break out in a rash around my inner elbows. This is great informations. Great Lee that’s a very proactive approach to being healthy.Thanks for sharing your health info.It’s good to know you are designing your own healthy life . Thanks Kylie.Glad I can help. I never knew you could get tested to check levels of vitamin D. I think I should do that. Most asias who have moved to the US are Vitamin D deficient. Good source of Information ! A special mention of Rickets and the 3 Lacs Units of Vitamin Dosages would be a great information. Also, if you can add on Vitamin D Deficiency and dosages for Protein Losing Entropy , it would be helpful to many. Hi Utpal the dosages is a bit tricky .I plan to have a part of this to highlight the normal and the mega dosing.Thanks for the help.Appreciate your feedback.